The famed shop is a must-visit for any Broadway lover visiting the Theater District. In 1965, former Broadway dancer Roger Puckett purchased an old frame shop that had been in business since the 1870s. The shop’s 45th Street location meant that Broadway promoters were always putting posters for their shows in his windows, and soon fans were asking if they could buy them. “We were putting Polish circus posters in our frames,” Puckett recalls, “but our customers were more interested in posters from Broadway. At first we were able to get extra copies from the men who were going around town putting up the posters, but getting them on a regular basis from the shows themselves took years.” Working tirelessly with producers and ad agencies to acquire posters for this untapped market, the Triton Gallery, one of the Broadway community’s unique players was born. Triton Gallery turns 50 this year and the art of Broadway shows is more collectible than ever. The standard Broadway window card measures 14 inches by 22 inches, a size dictated by the frames ticket brokers used to display them. Prior to the opening of Triton, window cards were almost exclusively used to advertise shows in the offices of ticket brokers, group sales vendors, travel companies, and local shop windows. The art they featured had to capture the imagination of ticket buyers, with standout illustrations and text. Many early posters were created by a show’s set or costume designer while others relied on contributions from some of the leading artists of the day. 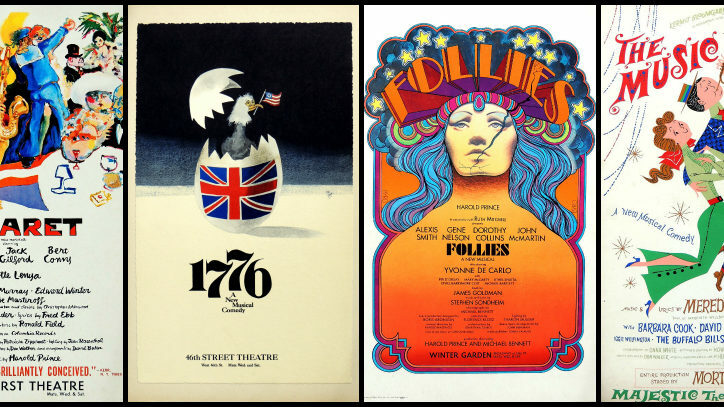 Printed in vibrant, silk-screened colors, these vintage cards are some of the most sought-after theater collectibles. The golden age of the classic Broadway musical, generally considered to be the time between Oklahoma! (1943) through Fiddler on the Roof (1964), saw a regular group of poster artists emerge. While their Broadway art was well known to theater fans, many of the designers were also in demand in other areas. Don Freeman (Me and Juliet, Say Darling) illustrated John Steinbeck’s novels. Tom Morrow (Fiddler, Cabaret, Zorba) drew for top agencies and created Borden Milk’s Elsie the Cow. David Klein (The Music Man, The Most Happy Fella, Cat on a Hot Tin Roof) created all the midcentury travel posters for TWA. Even Charles Addams, the macabre New Yorker cartoonist behind the Addams Family, contributed to the Broadway scene with images for a variety of successful comedies. The opening of Triton Gallery coincided with the next era of Broadway art. Faye Gage’s stunning Dear World has been on collectors’ “must-have” lists for decades and her design for 1776 actually resulted in the addition of a song to the show (“The Egg”). Hilary Knight’s illustrations for the Eloise books are as collectible as his posters for Half a Sixpence, Hallelujah, Baby! and No, No Nanette. David Byrd’s background in rock posters for the Fillmore influenced his vibrant and memorable designs for Godspell, Follies, and The Magic Show. Frank “Fraver” Verlizzo’s The Lion King is part of a chain of hits that includes Deathtrap, Sweeney Todd and Sunday in the Park With George. James McMullan’s watercolors have given Lincoln Center Theater a unique style and signature for nearly 30 years. For Triton’s first decade, Puckett had to cajole and often beg producers to run extra copies of their posters so he’d have enough to sell. (Copies of Funny Girl, Follies and A Little Night Music that bear the small print credit “Distributed by Triton Gallery” are examples.) By the mid-1970s, Puckett’s efforts paid off and producers began merchandising posters. Fans could now acquire window cards to all their favorite shows. Triton, with the world’s largest collection of vintage and current theater posters, became the source. Buyers from across the country looked to Triton to help them build collections of artists, titles, or simply posters that reminded them of treasured nights in the theatre spent with friends and family. For more information, visit www.broadwayposters.com.